software suite designed especially for newcomers to ASL. and hard of hearing people. vocabulary with full-color video demonstrations. user-friendly way to get started in ASL. Now, take advantage of special low pricing. Sale ends September 24, 2009. *For use on a PC. Check website for system requirements. focus on fundraising and donor relations. 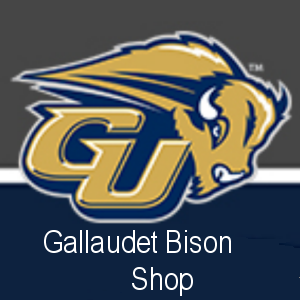 20-14 in overtime on Gallaudet grounds. one player faked his deafness! provide him with interpreters, it is routine news. the litigating student to prove her deafness! Solar means no need to purchase batteries! Will this concept work? Time will tell. the Buffalo, NY area, to attend a family wedding. to Buffalo, at least you will know why. 8 milk shakes? He wrote down "light milk shake"
looked like "eight milk shake". novel - Islay at a Philadelphia bookstore. wedding in the Buffalo, NY area. could benefit him in the long run. in signs with that woman, herself a NTID/RIT graduate. about certain family members that caught their attention. friend would make another comment about the same person. Both comments were opposites of each other. differently from a Hearing Eye? motorists that there was a club. That is the Buffalo Club of the Deaf! 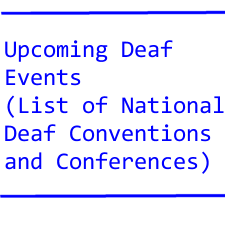 pointing to a club of the deaf is unusual. parents do not want to get involved! it to translate properly on the screen. and turn their backs on the CART provider. screen is right in the center of the group. leave the company for new job with another company. a better job of lipreading, than us, the humans. rate that we, the humans, perform. the deaf or to permit colleges to do the captions themselves. a deaf veterinary student about a decade ago - Dr Tom McDavitt. fought back and got herself readmitted, but resistance continues. has this full 911 capability. 911-less pagers and video relay devices. with and they freely admit they messed up. helping children change and grow. disability, handicap or veteran's status. - Must be fluent in ASL (American Sign Language) and English. - It is a full time school year (9-10 months) intermittent position. birth to 21 years old and their families in the Outreach Division. performs related and additional duties as assigned. home visits and general public. for some students? general hygiene and/or feeding as needed. Last day we will be accepting resumes is September 14.